Shalom Hartman Institute of North America is pleased to announce that effective May 14, 2018, Gabe Most will join our team as East Coast Vice President. In this role, Gabe will be responsible for developing and implementing strategies to strengthen the presence, partnership, and engagement of SHI North America in major cities from Toronto to South Florida, working with local community partners to build and expand our educational, programmatic and fundraising agendas. “We are thrilled to welcome Gabe to our growing North American team” said Yehuda Kurtzer, President of SHI North America. 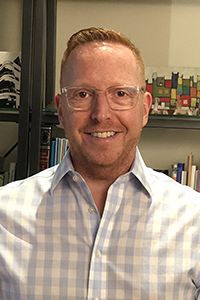 Gabe joins SHI North America from the American Associates, Ben-Gurion University of the Negev (AABGU), where he most recently directed programmatic efforts as Vice President of Programs and Special Events. Prior to AABGU, Gabe was Director of Strategic Initiatives in the Global Operations Division at United Jewish Communities; Director of Israel Programs for Young Judaea; and Community Emergency Response Team Program Manager in the New York City Office of Emergency Management. Gabe received his BA from Columbia University with a major in Jewish history and is a graduate of the Young Judaea Year Course in Israel. He is a volunteer with the American Red Cross in disaster response and with The Trevor Project in advocacy supporting policy change to enhance the mental health and well-being of LGBTQ young people. He lives on the Upper West Side of New York City.